I’ve had a handful of productive days painting, in spite of everything. 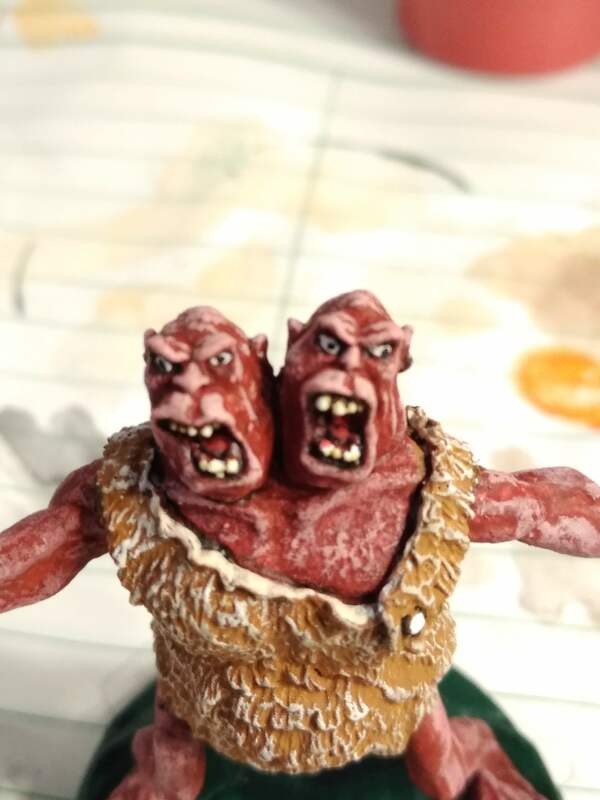 On my birthday, I finally painted the infamous Ral Partha three-headed troll! 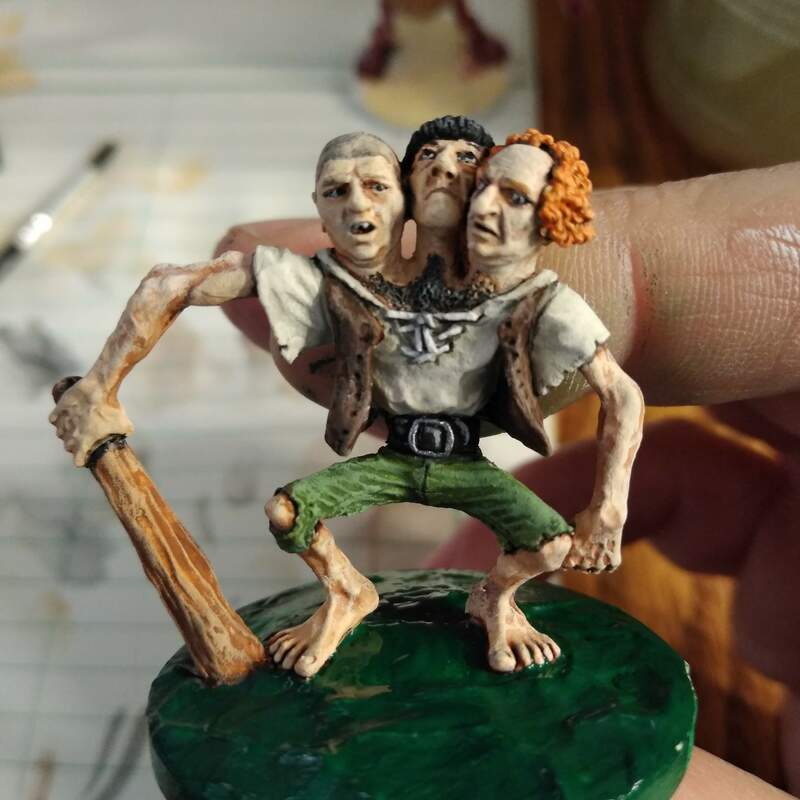 It is a bit of a testament to Tom Meier’s skill as a sculptor that when I uploaded a photo of this on Ye Faces Booke, I was asked to tag Curly and Larry! 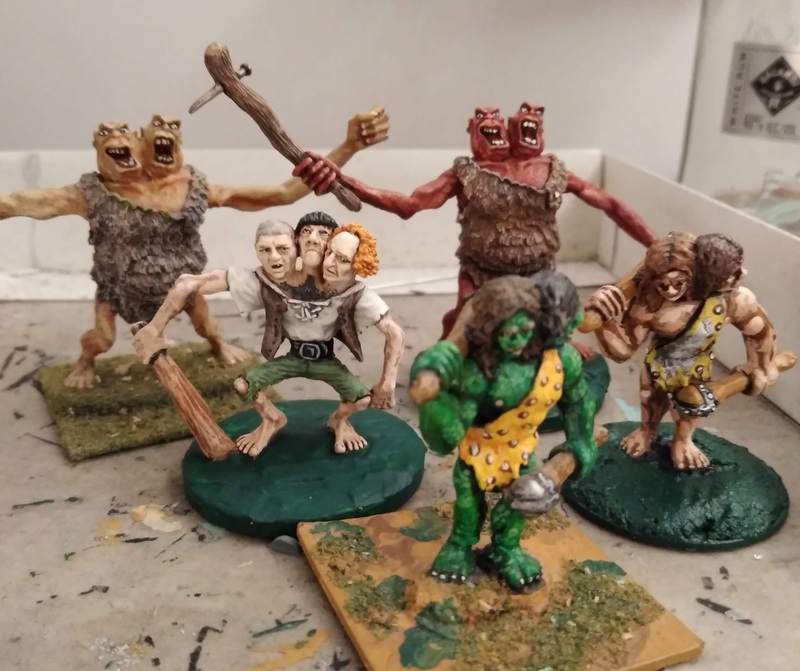 And here’s a group shot all the ettins I’ve painted to date. 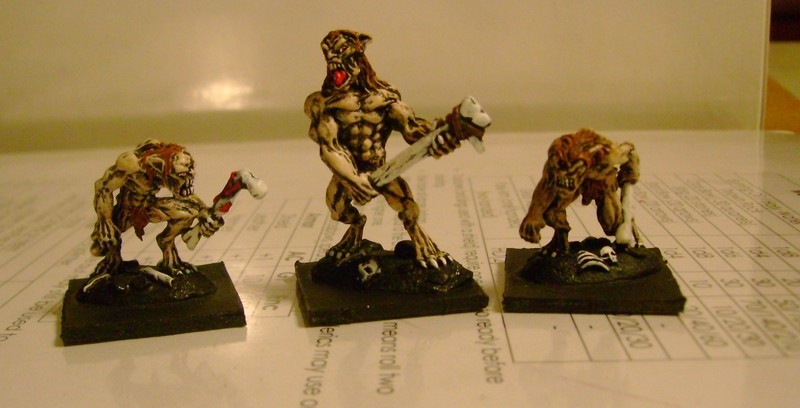 The tan ettin has the oldest paint job, though the green one (Grenadier) is my oldest and was repainted when I was in college some 25 years ago. 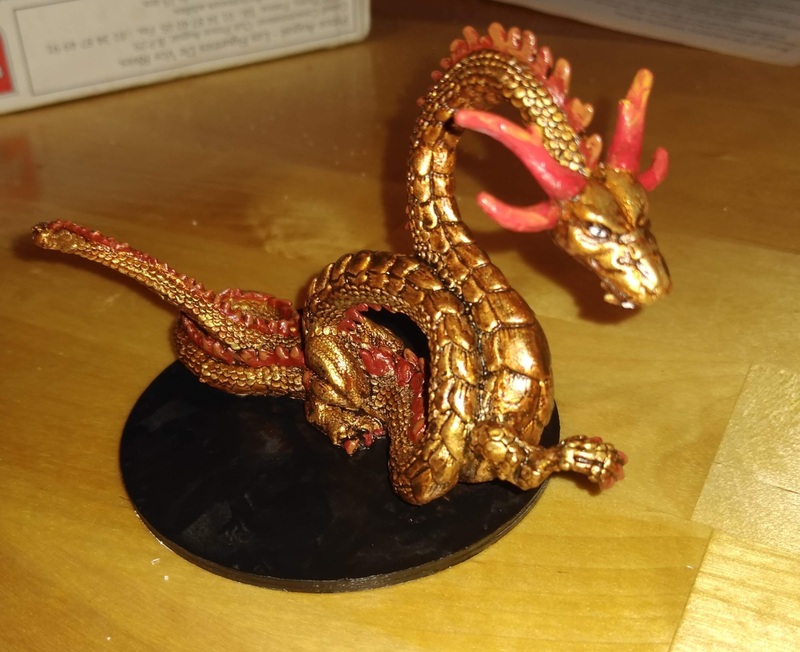 Next up, a Grenadier dragon. He came in a lot of old minis and needed a new passenger side front claw. A spare bit from a GW cold one sufficed. Because the color scheme is so simple he hardly took any time to finish. 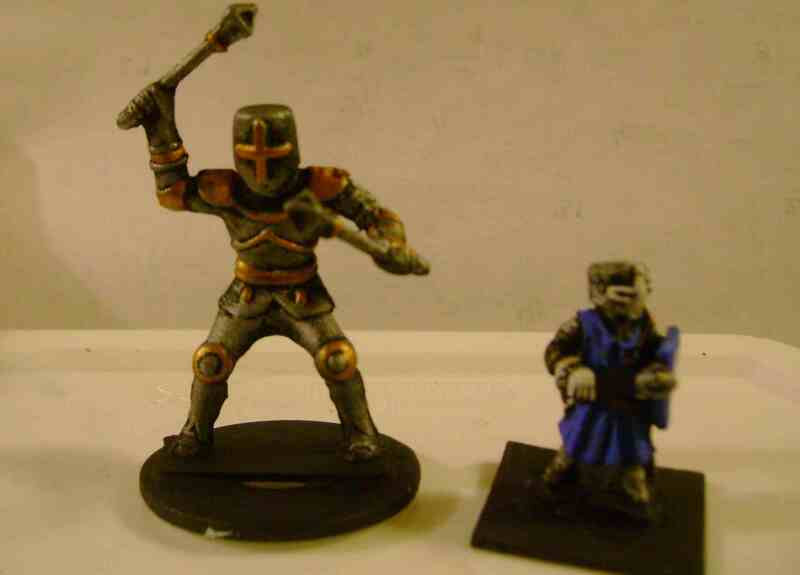 That same lot had a bunch of really old dungeon dressing, mostly from Grenadier’s old Wizzards & Warriors line. A couple of thrones or chairs. 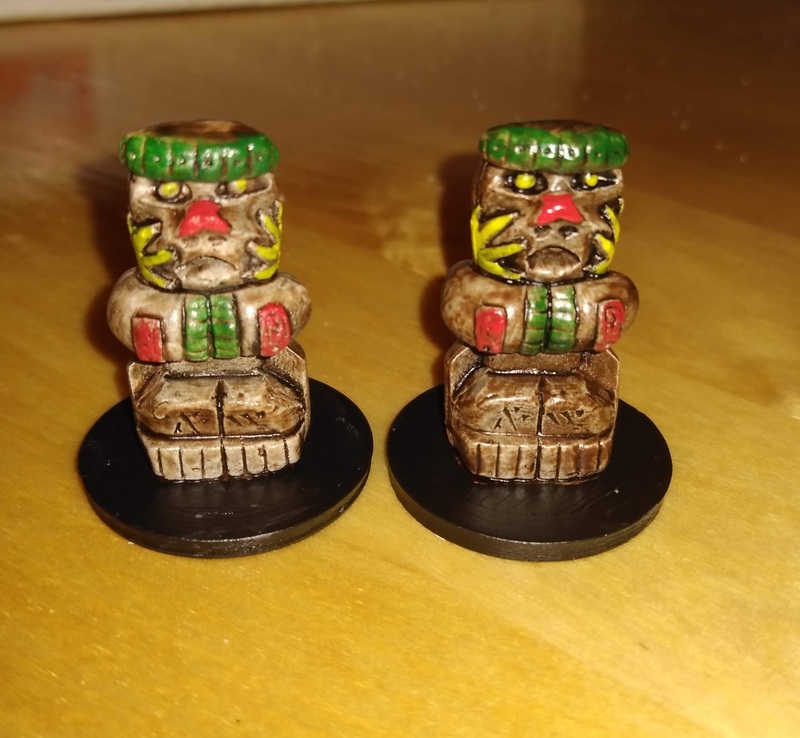 I believe they’re from the same “temple” set, but have what I can only assume are Indic naga figures on the backs. A pair of altars. Scale creep is real. 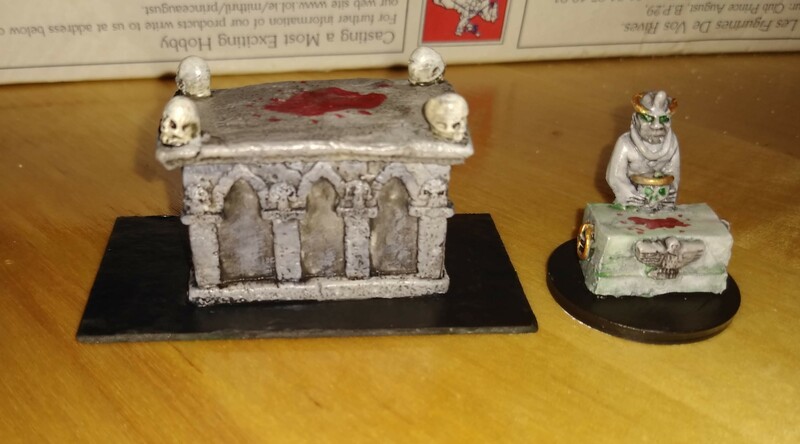 On the left, a Reaper Bones altar; on the right, the Grenadier W&W altar. 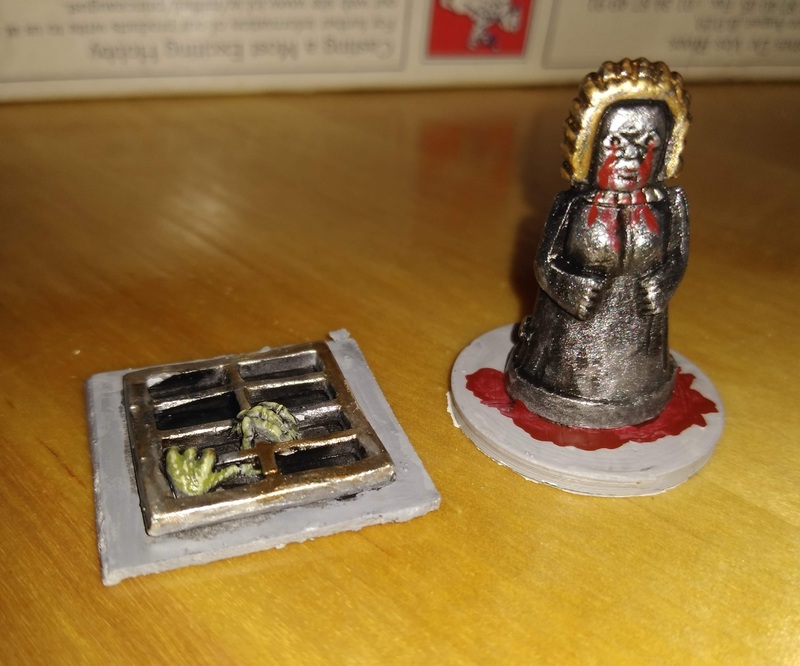 The demonic figure behind the small altar is a bit shorter than a typical man-sized 25mm miniature. Next, a few piles of bullion from the Grenadier W&W treasure room set. I have a another pile that came as a “bonus” in a set of supervillian villains from Grenadier. And these are pretty cool. 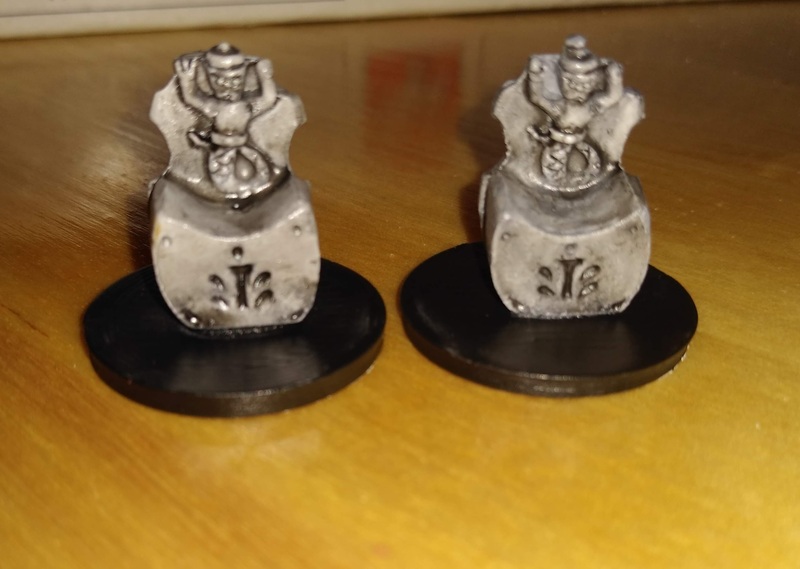 On the right, an iron maiden (also Grenadier W&W) and on the left, a mystery figure that seems to have been a “bonus” mini in certain Grenadier “Encounter …” boxed sets. 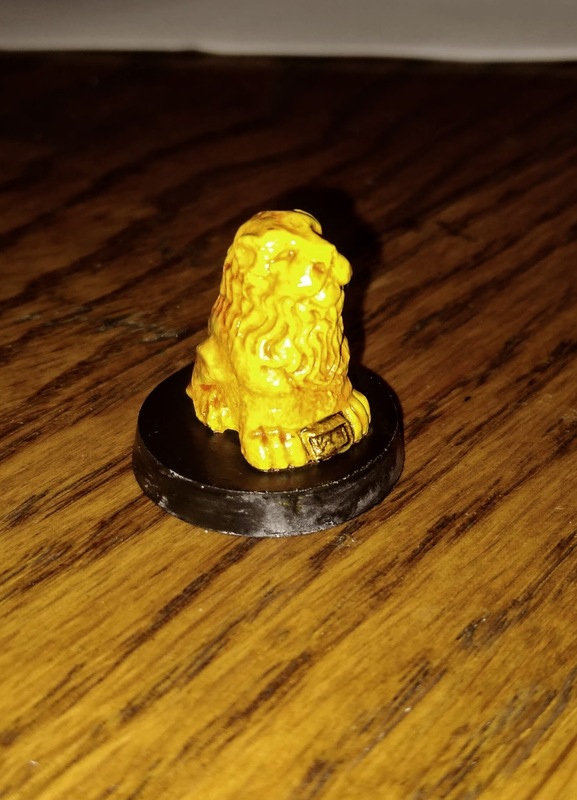 Several other pieces from the Encounter at Lloth-Komar were in the lot, and a FB group member asserts he got the same piece in his set, so maybe it’s just in that one. 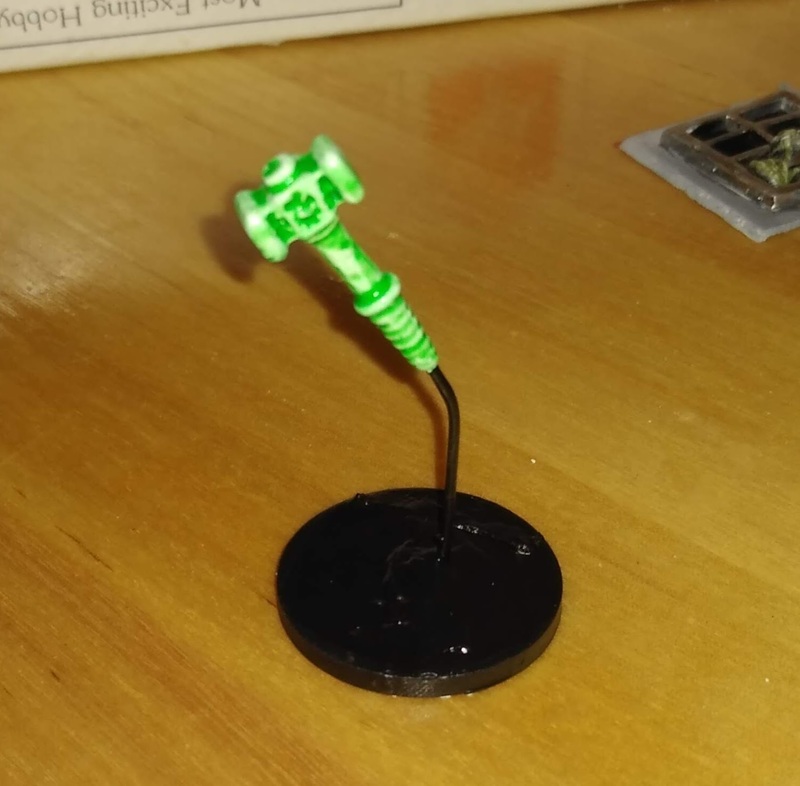 This next piece is a hammer from the board game “Dark World” mounted as a Spiritual Hammer spell. That spell has often featured in our D&D games so it will be nice to have a way to keep track of it. 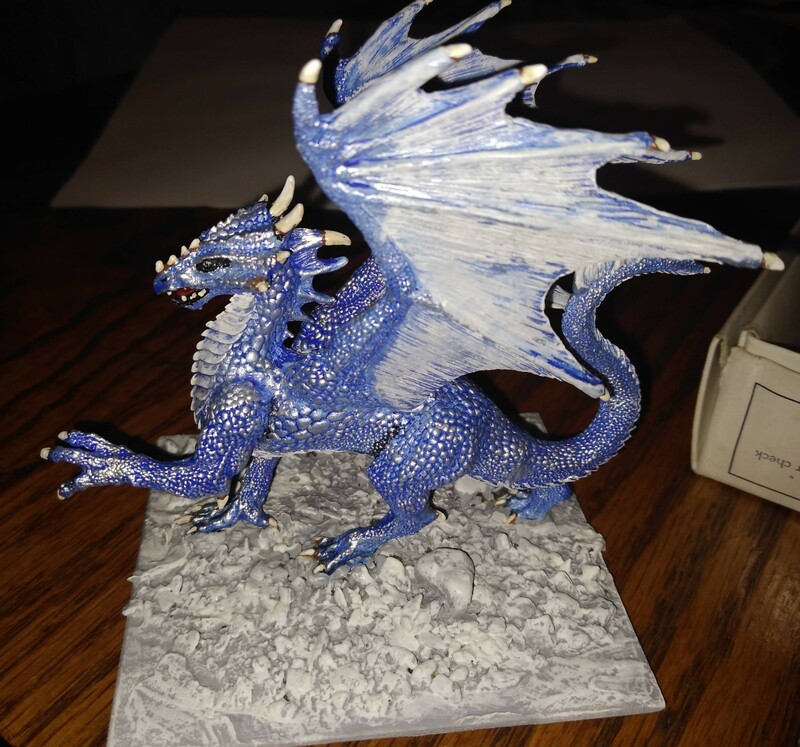 Another quickie paint job is this Reaper silver dragon. This too came it a big lot I bought online, and luckily with all its pieces. Back to the scenery, here’s a Minifigs Valley of the Four Winds figure: man impaled on tree. The VFW line is pretty great, and this one — from 1978 — is pretty unsettling. The humans in that range tend to be either in baroque armor from an Ian Miller drawing or 19th century finery. This chap has a high collared jacket and spats! Also from Lloth-Komar: a dragon statue. Next up a couple of fun items scavenged from bits and parts. 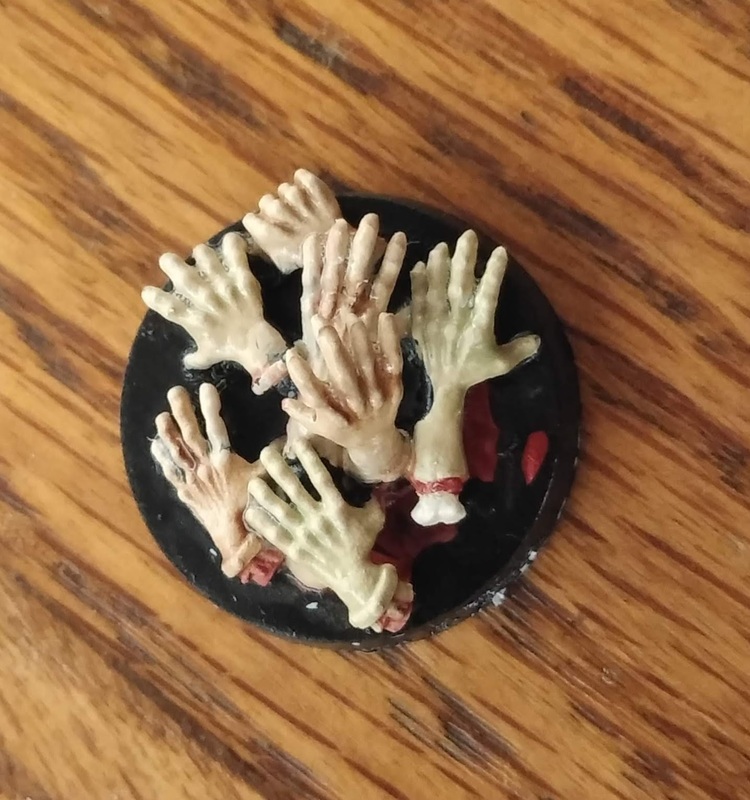 Inspired by the 1980s Michael Caine thriller “The Hand,” I took a bunch of spare hands from a plastic kit and made a swarm of hands. I also found an unidentifiable pair of hands that probably go to a scale model. The other hand holds a gun. But the clenched fist screams Bigby’s Hand spells, so I painted it up as one. 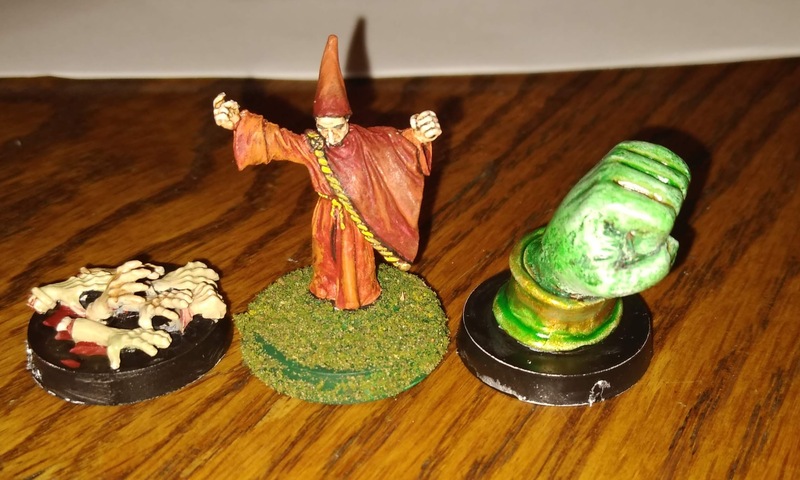 For scale, next to the wizard form last update. 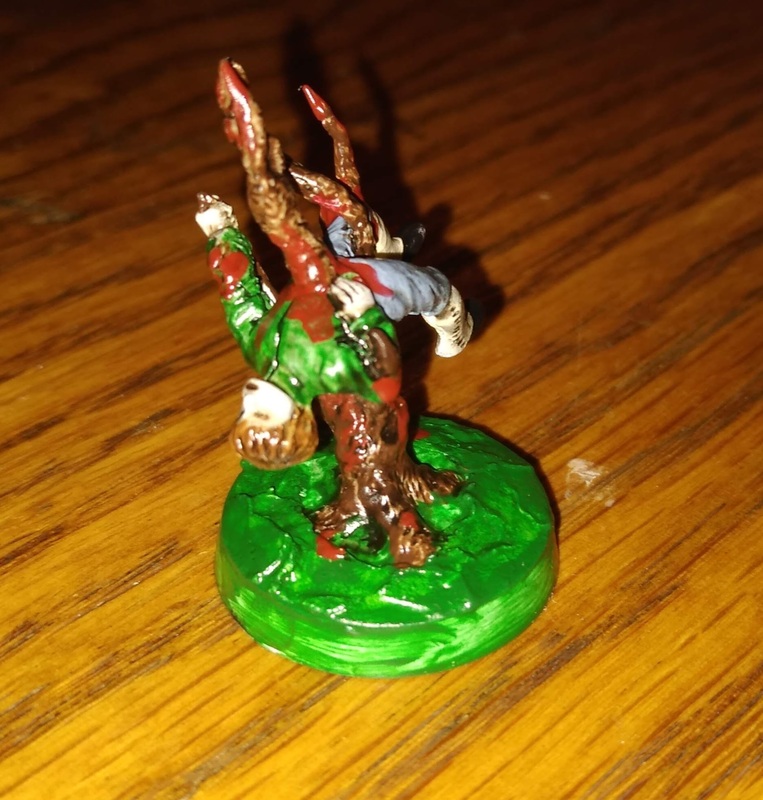 The greenish paint you may have noticed on the spells is a GW “technical” paint I bought on a lark. I decided to try it on some spirits I recently acquired. On the left, a Grenadier ghost. 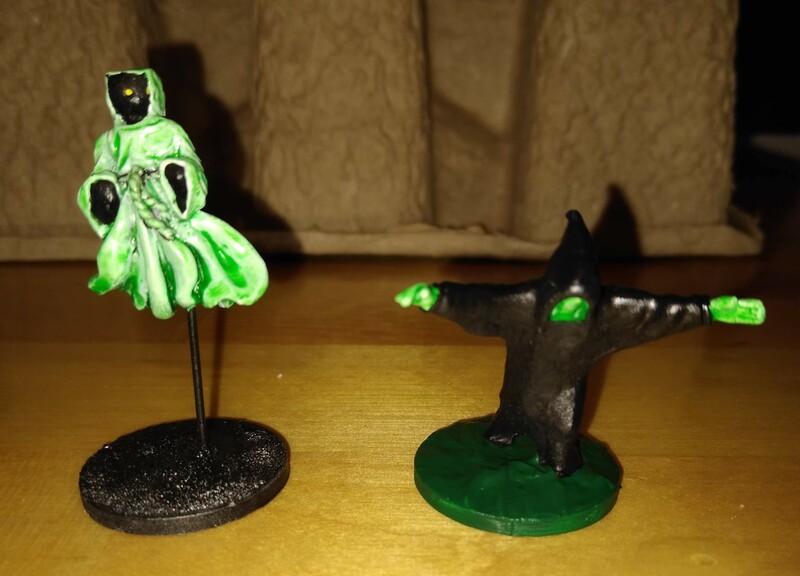 There is another version with a less fluttery cloak and base, and I have a few of those, so I decided to put this one on a wire like it’s floating. Next to it is a Minifigs Sword & Sorcery line ghoul. 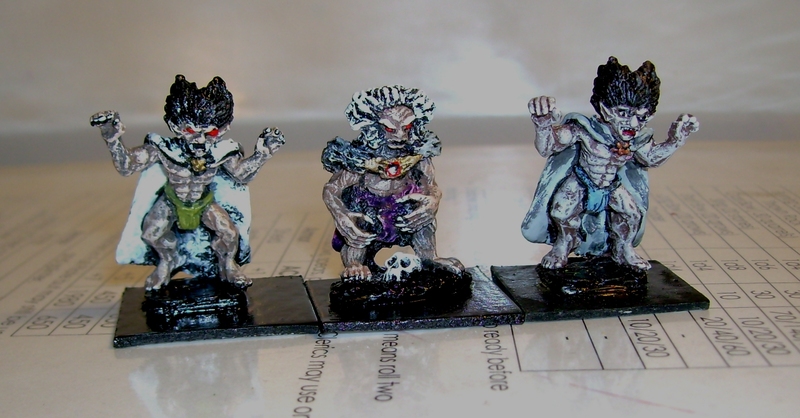 On the far left, a Wizzards & Warriors wraith. The other two are later versions of the wraith/ghost. They don’t really lean to the side, that is an artifact of taking a photo close up with my phone. 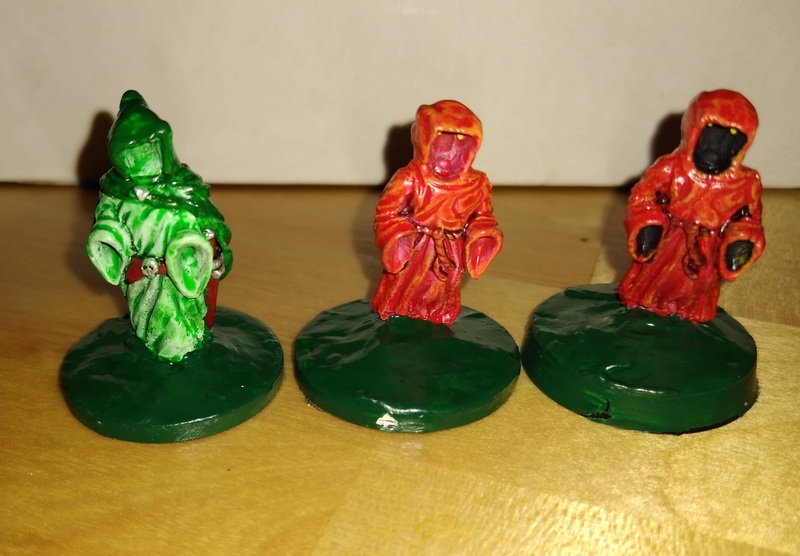 I have a lot of ghosts and wraiths painted various shades of grey, black, or white, so I figured I’d add a little color. I was really pleased to find this tree man (“Tree with arms and face”) from the VFW line. 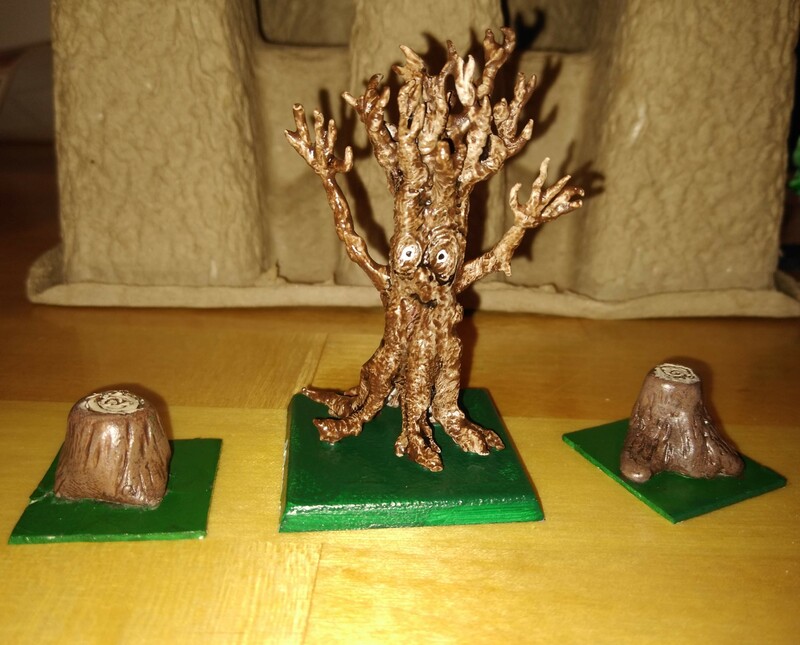 His companions are a couple of tree stumps made out of polymer clay, and will naturally serve as casualty markers for ents. These two were fun. 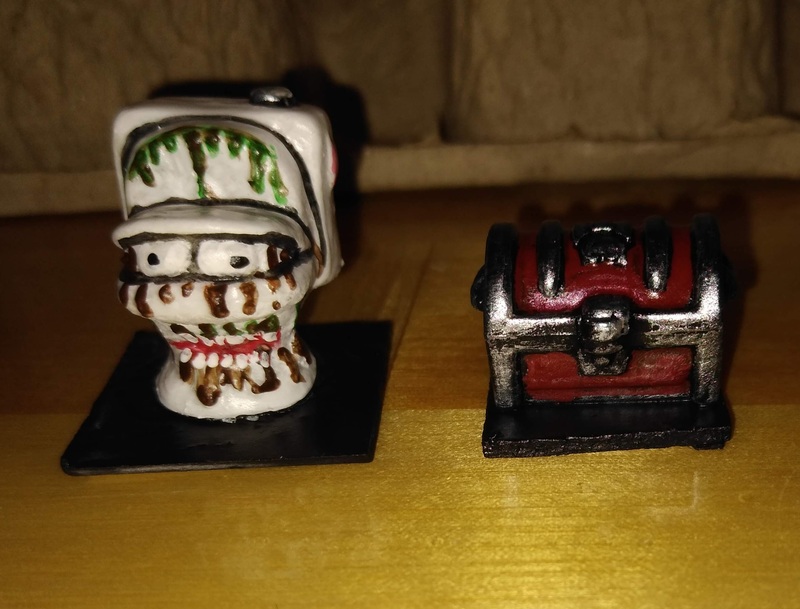 On the left, a toilet mimic, made of soft rubber and probably from a gumball machine. I inserted a wire for stability and painted a few layers of Mod Podge on it to make it a bit more stable and keep the paint from flaking off. The chest is just a plastic piece from a Weapons and Warriors game. I keep finding components to the games I picked up on clearance when Kay Bee went under 10 or 12 years ago. 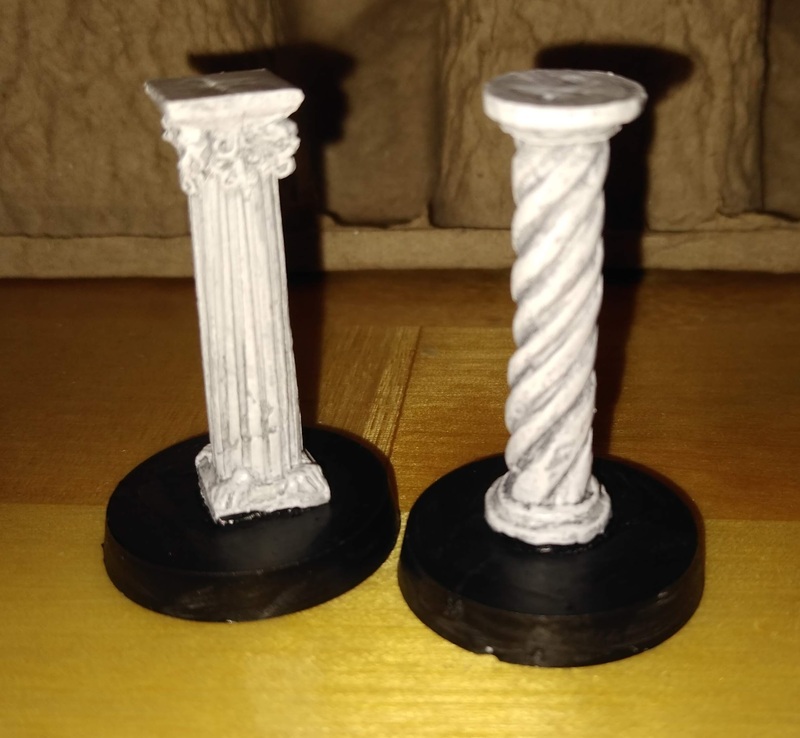 These are a couple of pillars from Citadel’s Fantasy Specials line. You never can have too many pillars. 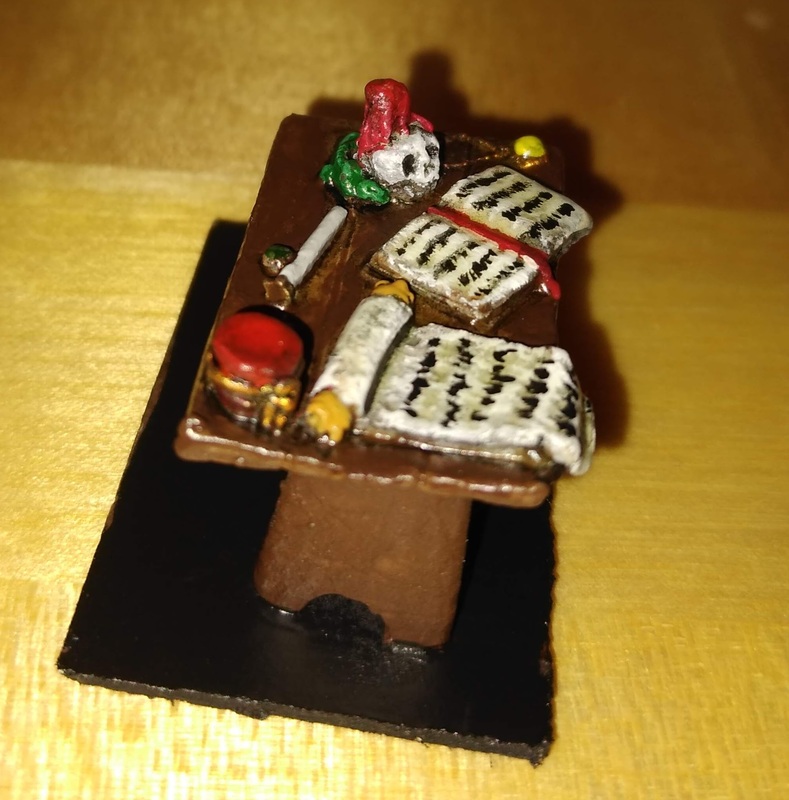 Another mini that somehow took me about thirty-five years to paint is this table from the Grenadier AD&D “Wizard’s room” set. Next to it is a scratch-built flying carpet made form epoxy putty. 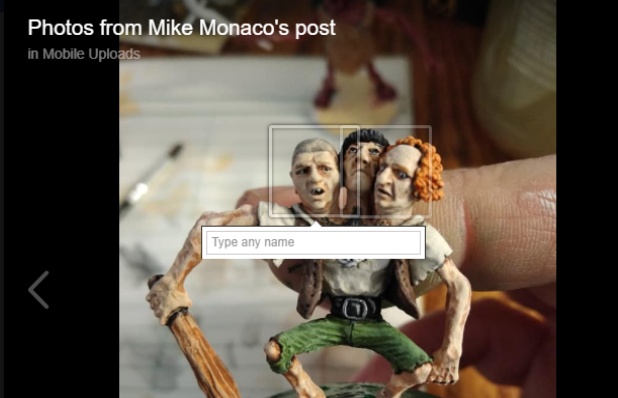 There’s a 1″ x 1″ flat space on it for a mini to occupy. I meant to eventually make all the possible sizes of flying carpets from the DMG but never got inspired. I especially like the little lizard behind the skull candle holder. 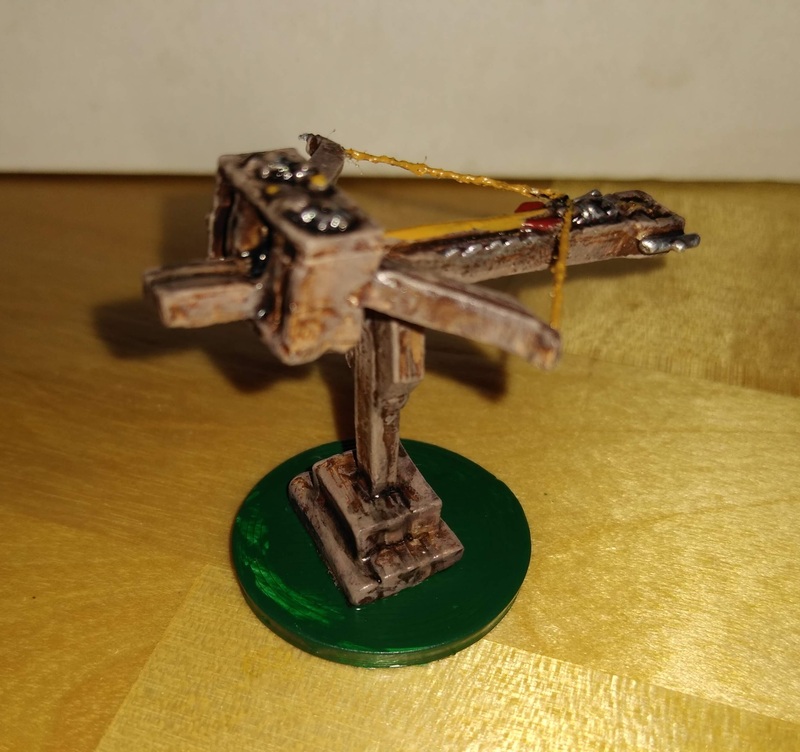 Lastly, a ballista which I am unsure of the origins of. 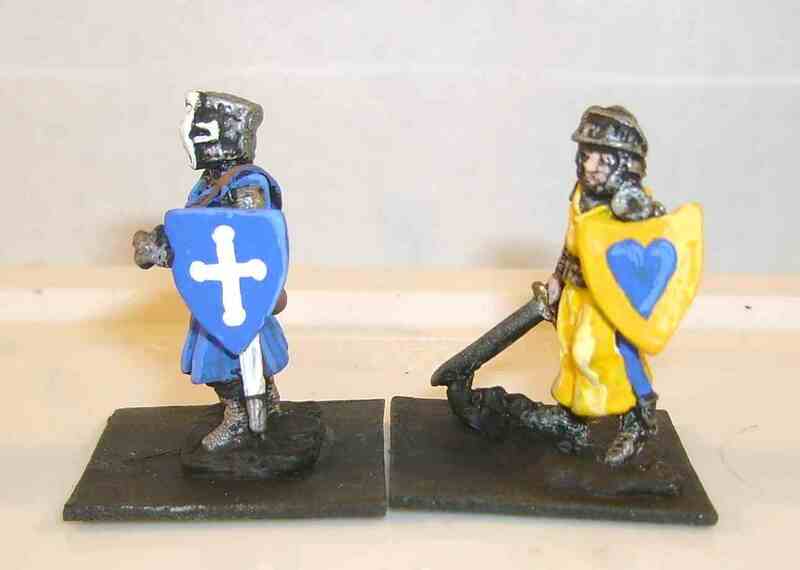 The lot it came in had both Roman and Orc crew from Grenadier, and a catapult, so maybe Grenadier. It’s quite large though, so maybe some other company. I added the string (a bit of thread). 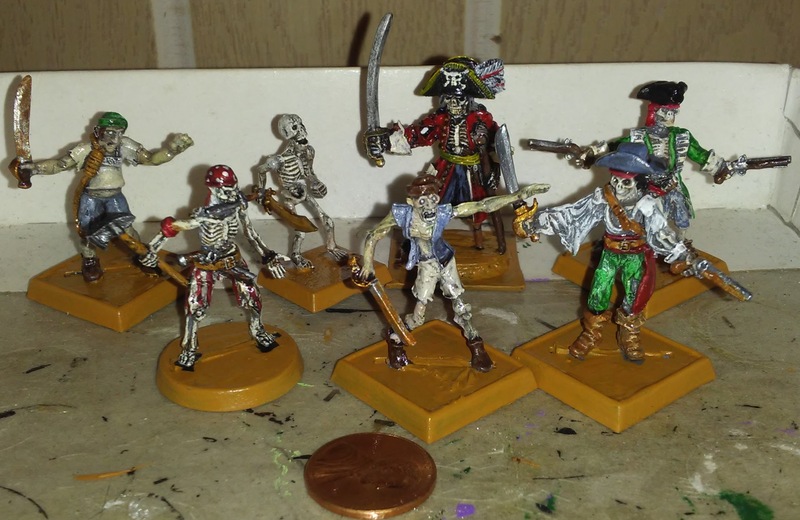 Still anticipating a swashbuckling game some time in the future, I painted all the undead pirates I picked up on clearance a few years ago and a couple of ghosts someone sent me gratis (Thanks Scottsz!). I spent a little less time than usual painting these, knowing that they would not see a ton of use and having so many to get through. 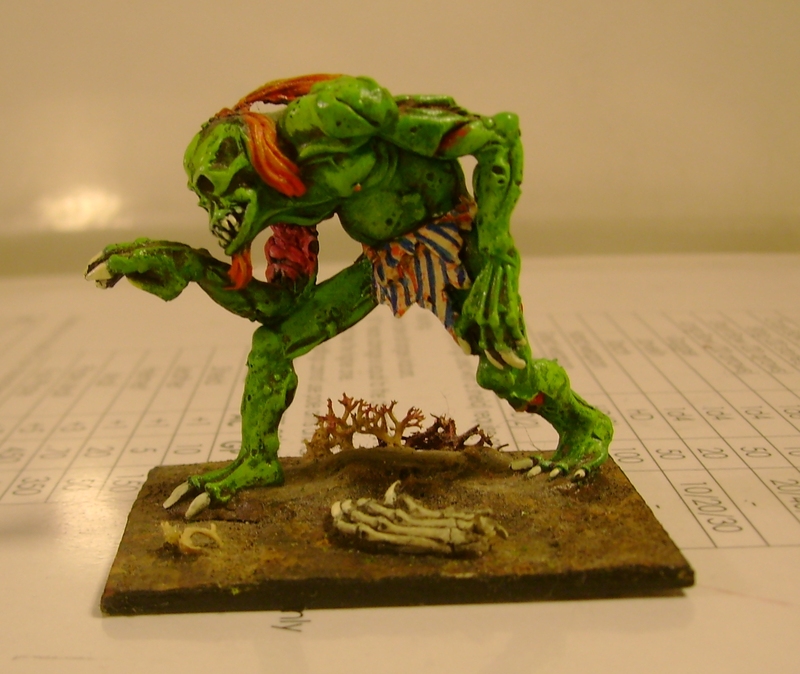 A nice dark wash cures many sins and makes the undead look suitably grotty, though I regret some of the hamfisted highlighting I added on the bones which came out too heavy and covered too much of the shading. 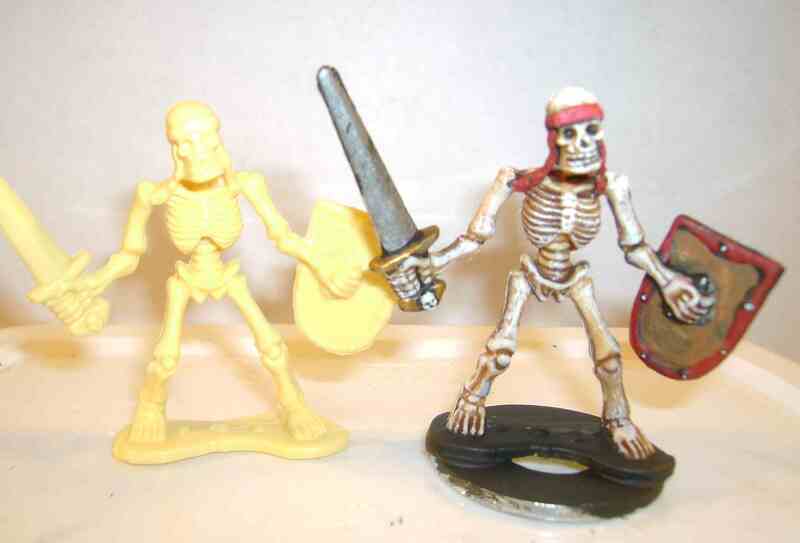 Mostly Reaper, except for one stray Citadel plastic skeleton from the 1990s. The one in the red coat was painted some time ago but I added a little detailing on his coat now that I have a better sense of how the cuffs and lining can contrast with the rest. 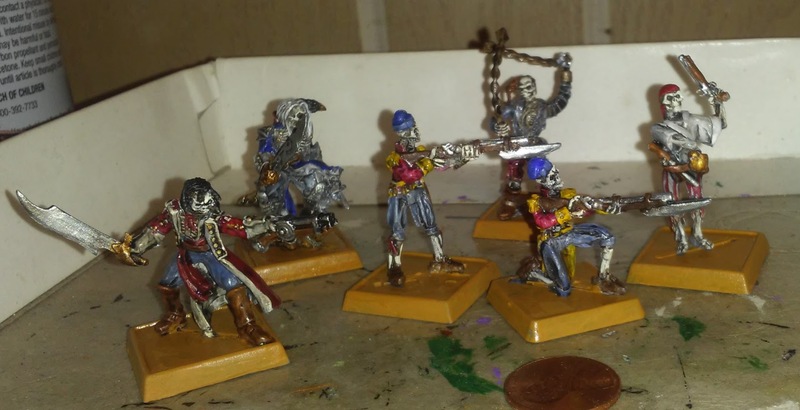 The two zombies and the plastic skeleton got a rust effect on their weapons (orange and brown mixed into the silver) but I wasn’t completely happy with it and did not do this to the others. These guys were a lot of fun. 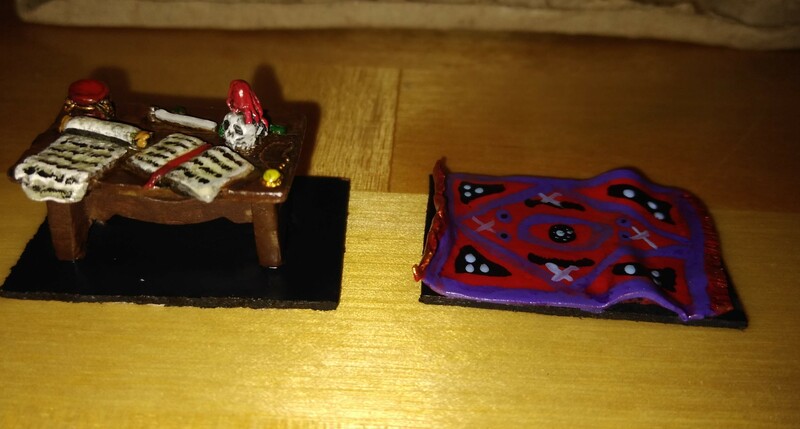 The violinist was a musician for some fantasy army but makes perfect sense to me for a ghost ship. The jolly spirits are Rafm. 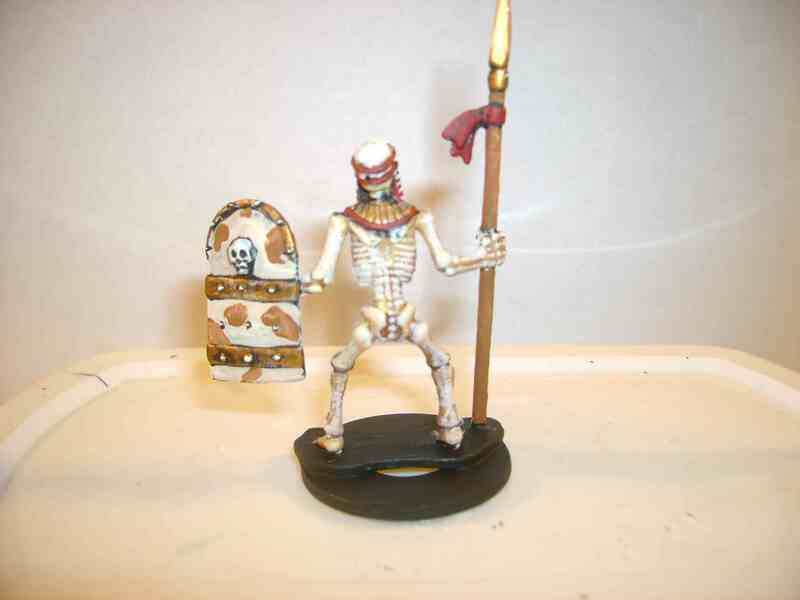 The skeletons, Reaper. Last yet more Reapers. 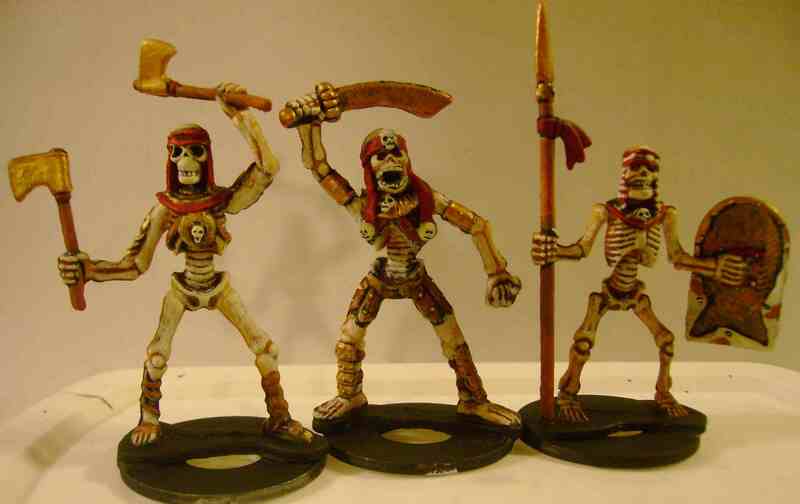 The one on the far left has no jawbone, which makes skeletons so much more creepy IMO. The guy in the blue coat behind him is not shown at a very flattering angle but he has a crow perched on his shoulder and his face came out pretty good, honest. Some day all the pirates and swashbucklers will get better basing — maybe sand or if I get ambitious, wooden planking to suggest a deck. I also thought about adding seaweed draped over some of them but haven’t thought of a good way to accomplish that. I recently read Ghosts : a natural history by Roger Clarke. For the record it is much less a natural history than a social history, and it really only covers the last 300 years and mostly in England. Clarke tries to be impartial but admits that he is fascinated by hauntings and seems to want, pretty strongly, to believe in ghosts. But I did find some really neat, perhaps gameable tidbits: (1) The ancient Greek taxonomy of ghosts; (2) the modern occultist taxonomy of spirits; (3) medieval lore on the color of ghosts; (4) what ghosts most fear. Underwood’s list omits the ghosts of animals, of which Clarke provides a few examples. Ghosts, to the medieval mind, must be the souls of those not in heaven (for why would they ever leave) or hell (who cannot escape), which is to say the souls of people in Purgatory. Therefore they are still expiating their sins and so they appear in various shades from black (for the most recently dead, still stained by sin) to white (for those nearly finished with Purgatory and nearly unblemished by sin). Of course Protestants would have to therefore deny that ghosts are possible, for there is no Purgatory in their doctrine. Any “ghost” must be a demon. Finally Clarke notes that exorcists held that the threat of banishment to the Red Sea was the most fearful threat one could make to a ghost (or a demon pretending to be a ghost). Clarke admits he has no idea why this is so, which is surprising. The legend of Solomon using a magic ring or seal to control djinn should be familiar to anyone who has researched magic beliefs. Solomon supposedly sealed the djinn in bottles and dumped them the Red Sea, where they have mostly languished since. *A pretty decent overview of ancient ghost beliefs is here. St. Pancratius of Wil. Click to embiggen! I just picked up a copy of Heavenly Bodies: cult treasures & spectacular saints from the catacombs. It’s a book with tons of photos of bejeweled and bedazzled relics from across Europe. Some are reclining or posed like St. Pancratius above (& he’s pretty conservative, just being in fancy armor); others are just lying in jumbled ruins but heaped with gems and gold. A lot of them have rather disturbing facial features added to the skulls in wax, as well as life-like glass eyes, and others are veiled in gauze, giving them a doll-like aspect. 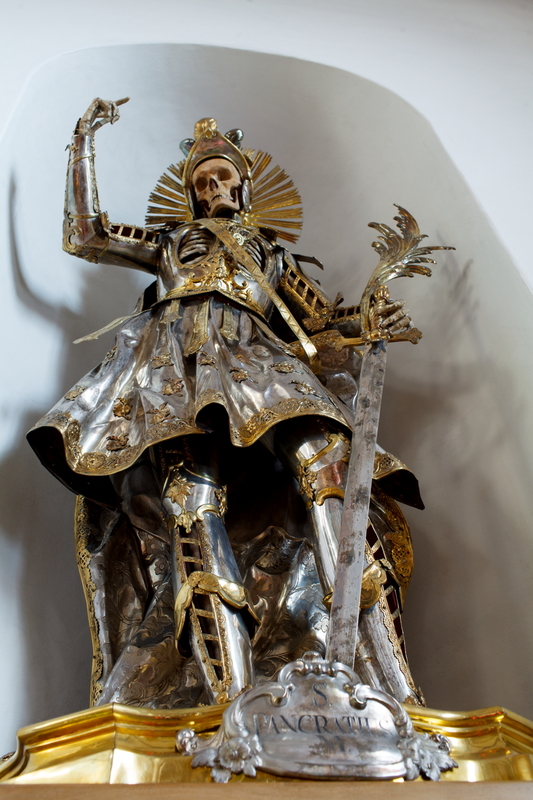 This St. Pancratius was, apparently, originally buried in Roman legionary armor, but when his relics were translated (moved from a tomb or crypt to a shrine or altar), he was decked out in the latest parade armor. I couldn’t easily find any more on him — there are two other early martyrs but neither is in Switzerland, as this one is. More on the book here ; even more photos here. 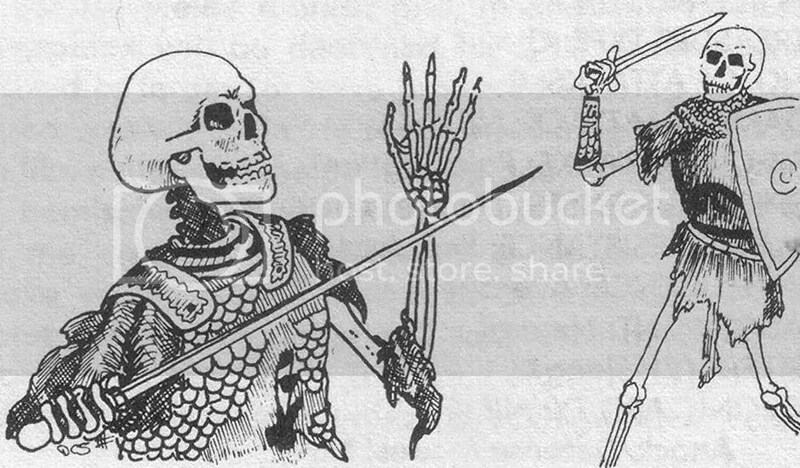 Back when I first got to look inside the Monster Manual (the guys my brother & I started playing with never let us look inside the DMG and MM, rat bastards) my favorite monsters were skeletons. I’d always been into drawing skeletons since I was a kid, and Jason & the Argonauts was one of my favorite movies, in fairly heavy rotation on UHF. 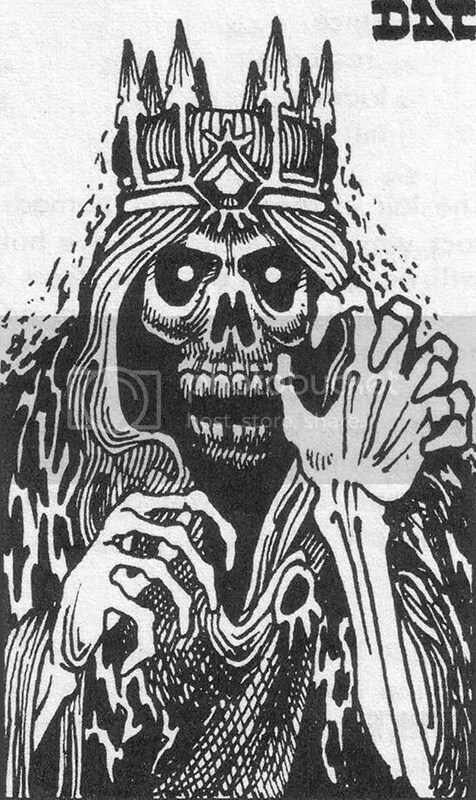 When I found the lich, I liked them a lot too — here’s the king of the damn skeletons! Doesn’t hurt that they’re one of the tougher monsters too, with the magic use and all. 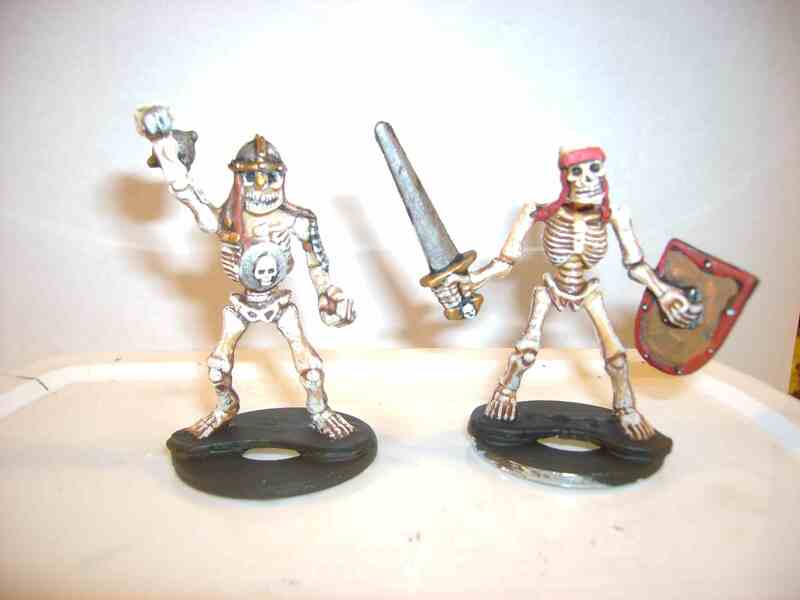 But now that I’m DMing, I find that I actually like ghouls and ghasts more. They are terrifying with their paralyzation attack and multiple attacks. In my current campaign, the very first session had a TPK when the party stumbled onto a ghoul. 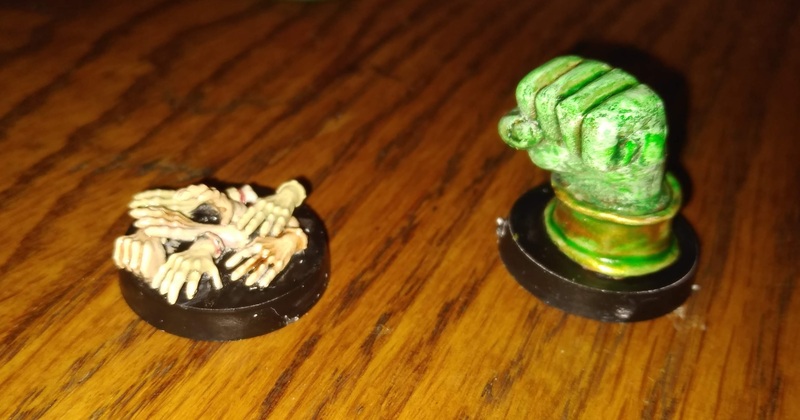 Almost two years later, there was near-TPK (one survivor) in a series of encounters ending with a handful few ghasts. Ghouls and ghasts in numbers are a threat to any party, at least as far as my group has gotten. 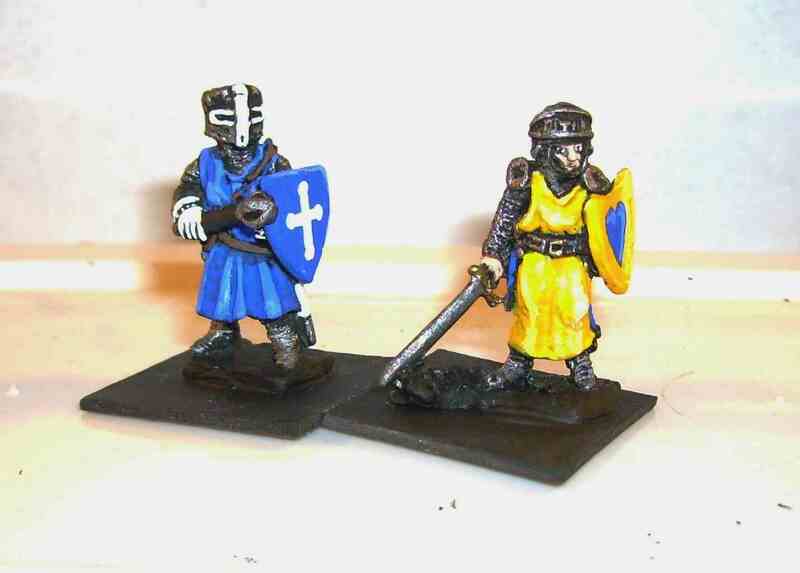 Plus I painted some nice figures for them. 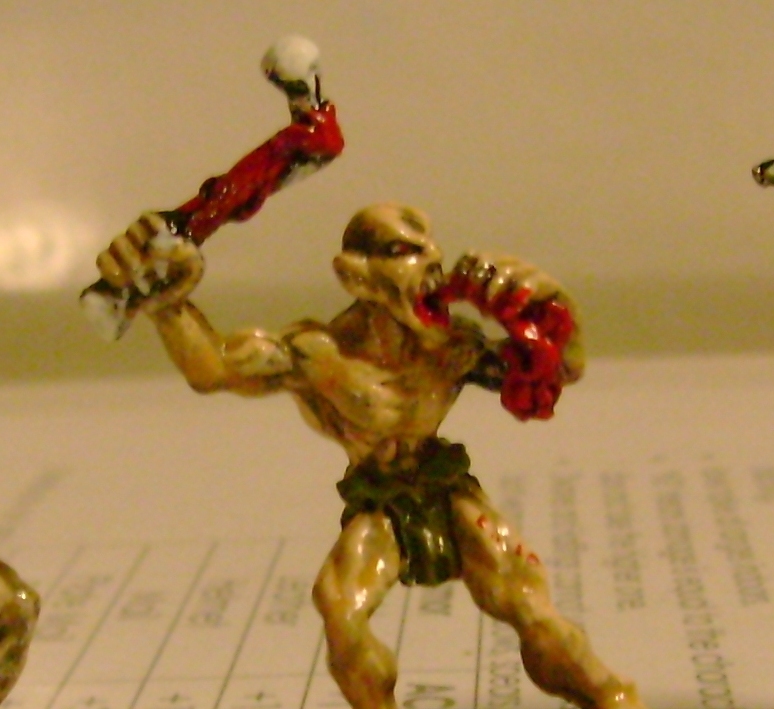 But my players have characters around 7th level, so even ghasts are less of a challenge. The next logical step is a wights. I wish had more wights. 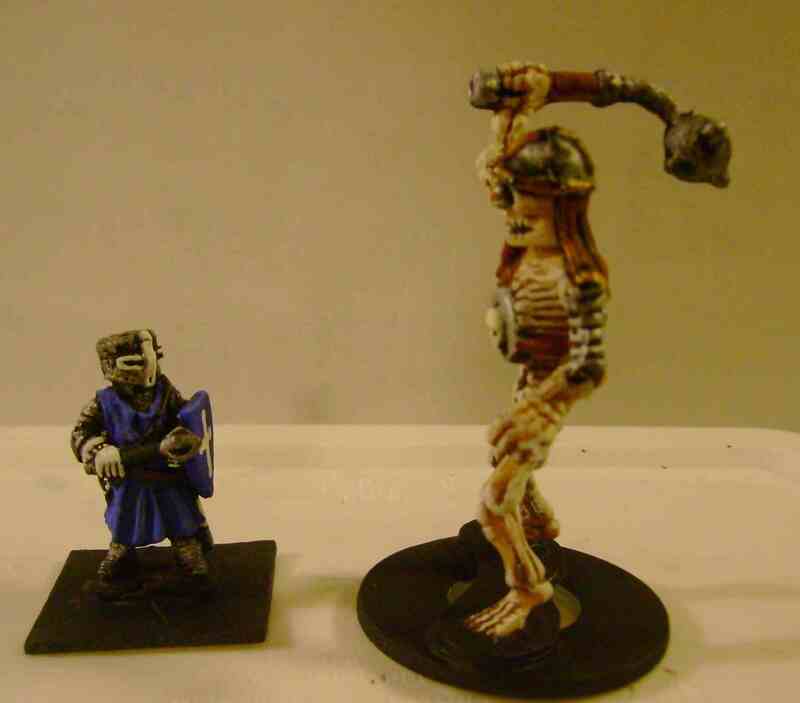 I think the big guy on the left is a ghast, or at least a boss ghoul! Again there is an obvious boss and two lesser ghouls. 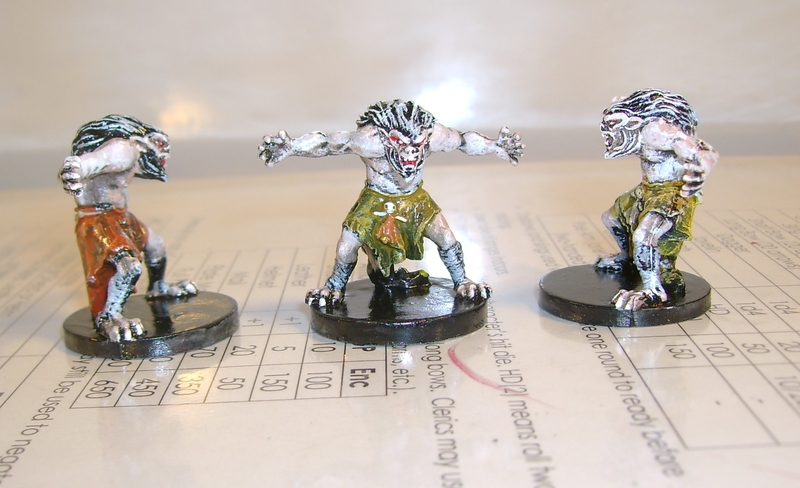 Ghouls are great monsters because in D&D they really are very scary for lower level characters, since they make three attacks and their touch paralyzes. A large number of ghouls poses a threat even to mid and high level characters, especially if they are fortified with ghasts or thouls. 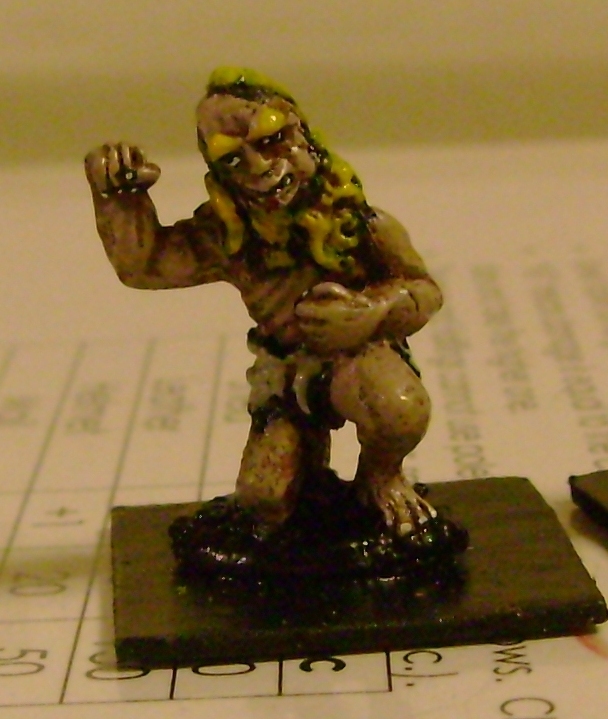 Lastly, an undead troll which I think was made was Rafm? The bone paw on the ground there is an actual rodent skeleton part from an owl pellet I found in my parent’s back yard a long time ago. I’m thinking it was a mole’s, based on the claws. If you don’t have any owls puking up bones and fur in your area, you can always go mail order for those authentic parts. Why red hair? Contrast. 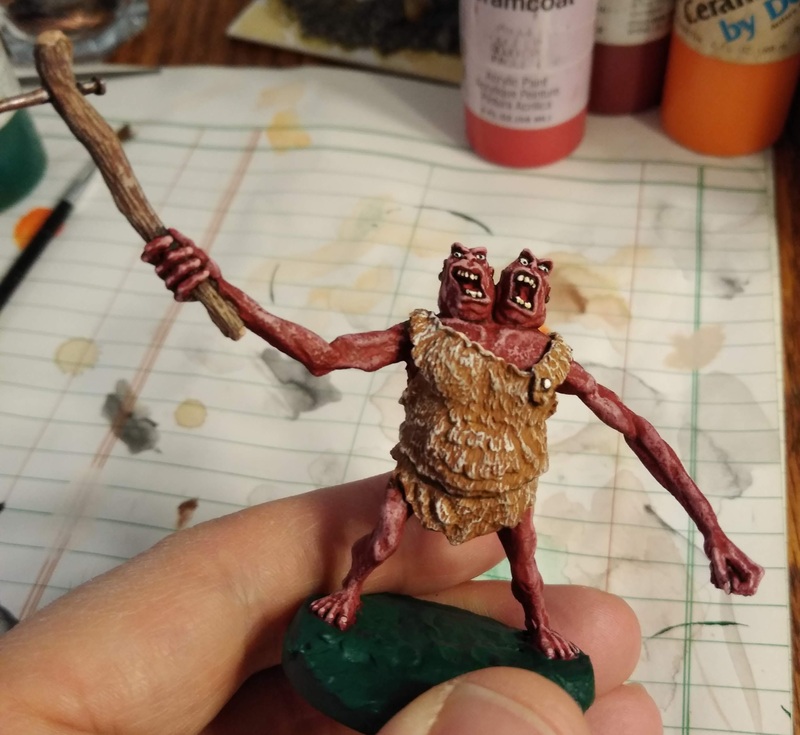 I painted this guy when I was spending WAY more time per figure than I do now. Painting stripes on clothing? 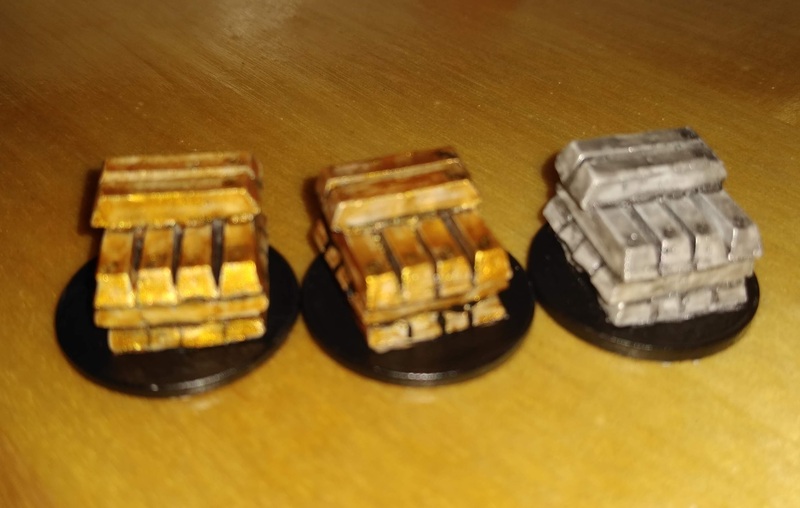 Textured bases? Who has time for that?! ?